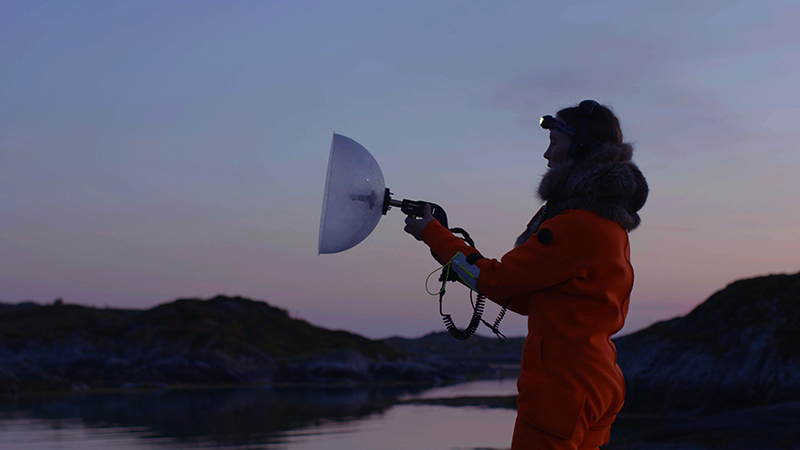 Located on the Lofoten Islands in Northern Norway, Acoustic Ocean sets out to explore the sonic ecology of marine life. The scientist as an explorer and important mediator of the contemporary understanding of our planetary ecosystems is a central figure in this video. 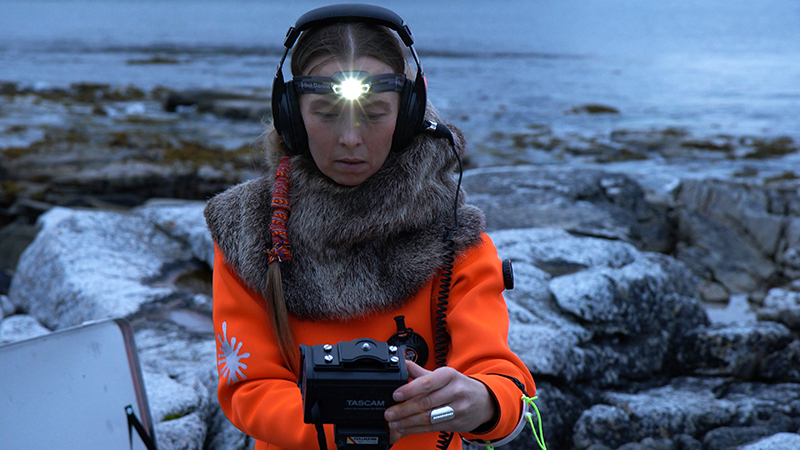 She makes her appearance in the person of a Sami (indigenous of northern Scandinavia) biologist-diver who is using all sorts of hydrophones, parabolic mics and recording devices. Her task is to sense the submarine space for acoustic and other biological forms of expression. Sonic manifestations are vital modes of communication, navigation and survival for a great majority of deep-sea beings. Given the poor visibility in the deep sea, the sonic dimension is the primary means of communication, navigation and survival in this penumbral liquid universe. Acoustic Ocean is a science fictional quest into an amphibian life world that is constituted by an assemblage of human, marine, machinic, organic, climatic and digital elements, which are all utterly interdependent. A techno-organic bond links this aquanaut with her body with the sensorial instruments and the sonic environment of the vast multiplicity of sea creatures she is exploring. In this scientific array, any form of critical distance between the scientist, her research subject and the instruments, is absent. They have all grown together. The hydrophones laid out like tentacles over the dark rocks, taking on characteristics of deep-sea creatures. This feminist posthuman figuration suggests a porosity, permeability and connectivity of the human body with regards to water and the many life forms it sustains and ingests. The artistic gesture of this artwork is that of rewriting a script for inter-species relations and of a mind-body intra-active form of knowledge creation. It addresses the science of a marine landscape by showing the scientific interest in the images and sounds of an altered sense. Acoustic Ocean draws on a range of recent scientific insights in its foray into modes of marine biological expressions, proposing an immersed image for the complex and fragile interactions and responses between humans and nonhuman, knowledge and instruments in these multimedia landscapes. Crew: Set designer Michael Graessner (Berlin) has designed the props for the marine scientist. Sofia Jannok, singer, musician and climate activist from the Sami Northern Scandinavian indigenous community is doing the performance and Lydia Zimmermann the camera (Barcelona/Zurich). Patrick Codenys (Brussels) is the sound designer. 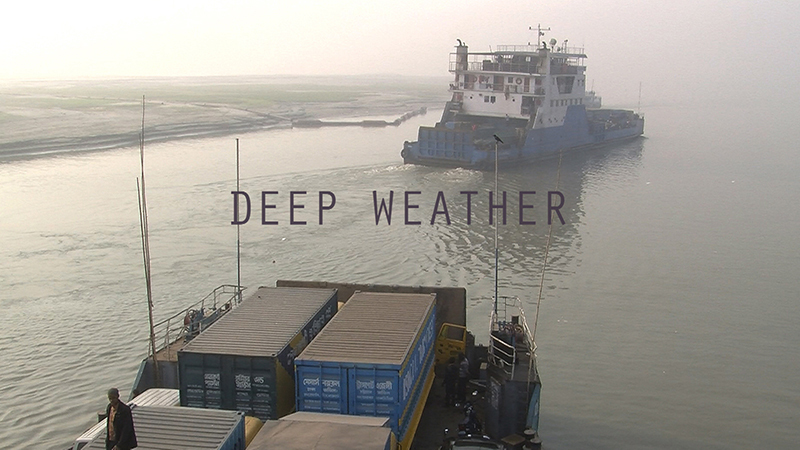 Deep Weather draws a connection between the relentless reach for fossil resources with their toxic impact on the climate, and the consequences this has for indigenous populations in remote parts of the world. The video begins above the huge open pit extraction zone in the tar sands in the midst of the vast boreal forests of Northern Canada. After the oil peak, ever dirtier, remote and deeper layers of carbon resources are being accessed now. Aerial recording of the devastated crust in the state of Alberta opens the view into the dark lubricant geology. Aggressive mining, steam processing and evacuation of the tar-sands are impinging on environmental and human rights. Melting Himalayan ice fields, rising planetary sea levels and extreme weather events increasingly define the amphibian lifestyle imposed on the Bangladeshi population. Climate change, exasperated by projects such as the Canadian tar sands, puts the life of large world populations in danger. 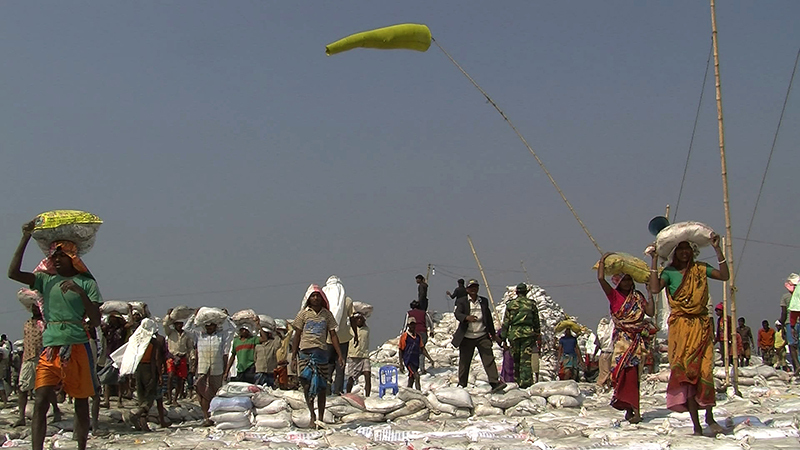 The video documents the gigantic community effort in building protective mud embankments. Hands on work by thousands without any mechanic help is what climate change will mean for most people in the Deltas of the global south. These are the measures taken by populations who progressively have to live on water when large parts of Bangla will be submerged and water is declared the territory of citizenship. Oil and water are taken as the two primordial liquids that form the undercurrents of all narrations as they activate profound changes in the planetary ecology.